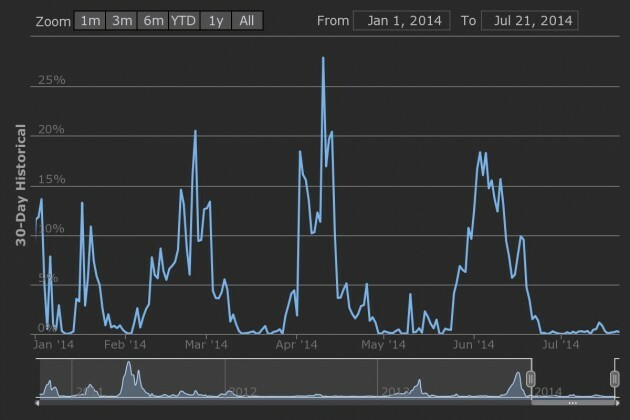 The last two months have seen no shortage of positive bitcoin news. DISH became the latest big retailer to accept bitcoin in June, only to be eclipsed six weeks later by Dell. Then, there was the successful US Marshals auction of roughly 30,000 BTC, which proved bitcoin’s fungibility in the eyes of the US government. 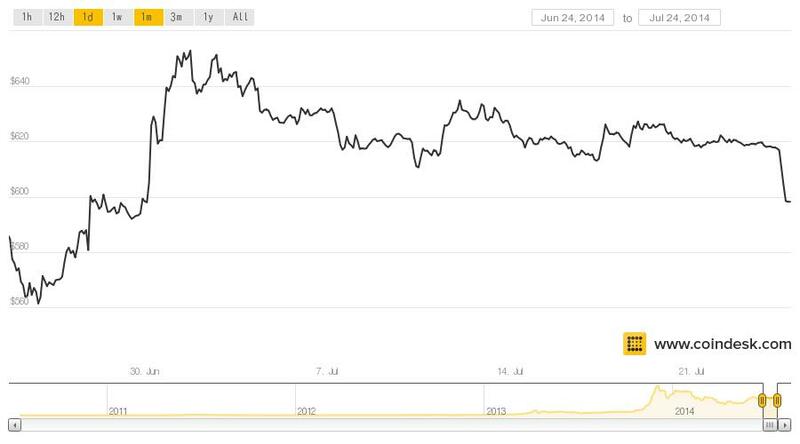 With all that good news, bitcoin’s price must be rocketing again, right? Hardly. In fact, price volatility has been flat in the last month, making it the most torpid period this year, according to the Coinometrics volatility index. One exchange operator I spoke to was as mystified as the rest of us. The last two month’s newsflow should have goosed the price, but it barely budged. “In any other time, in any part of 2013, and even before that, an event like Dell [taking bitcoin], would have shot the price up by 20-50%,” said Mark Lamb, chief executive of London-based exchange Coinfloor, which has been growing its daily trading volume of about 150 BTC since it launched in March. In fact, the value of a bitcoin hadn’t closed below $600 over the last 30 days, according to the CoinDesk BPI, except for a blip today, which saw it dive briefly to a low of $591. At press time, the price of bitcoin on the CoinDesk USD Bitcoin Price Index had lost its long-time stability, dropping roughly 4% since the day’s open to sit at $595.73. This figure was up from the day’s low of $591.46, but down measurably from its high of $618.42, figures that baffled traders and reddit readers alike. The day’s low was observed at 13:35 UTC and was followed by a sharp recovery, but it wasn’t enough to undo the mysterious and sudden decline. Prices on the CoinDesk CNY Bitcoin Price Index followed a similar trajectory, falling from an open of ¥3,832.17 to ¥3,692.45 at press time, but for once, even China wasn’t to blame for falling bitcoin prices. With no clear news to blame for either the stability or the decline, many are wondering where to turn for answers. Maybe bitcoin’s price needs more than good news. After all, people need time to figure out world-changing, disruptive technologies like bitcoin. Positive newsflow in the interim isn’t going to help the world adapt to our bitcoin future, no matter how many computers Dell sells. That’s what Joe Lee, a trader and founder of bitcoin derivatives exchange BTC.sx, thinks is going on. “The price is stagnant because we’re going through a trough of technology adoption for crypto currencies, where the world is working how to take it,” he said, citing technology research firm Gartner’s theory of a technology adoption ‘hype cycle’. Gartner’s hype cycle, which comes complete with interactive chart, is a fancier way of saying that all that positive news is going to take time to sink into people’s minds. 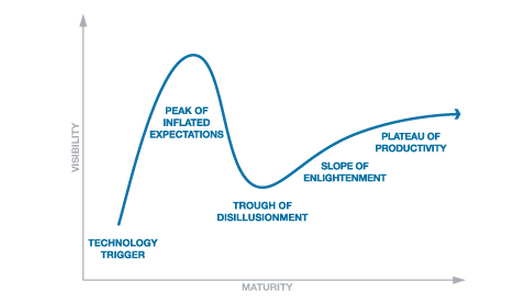 In Gartner-speak, we went over the Peak of Inflated Expectations in January, when the price was soaring, and now we’re headed into the Trough of Disillusionment. And then there is this succinct explanation, from Jean Marie Mognetti, a partner at Global Advisor, which is launching a hedge fund regulated by Jersey authorities that will open for subscriptions on 1st August. Mognetti says his firm’s bitcoin fund is aiming for $200m under management in a year’s time, which would put it $50m above current hedge fund heavyweight Pantera Capital. “There is nothing in particular going on in the market at the moment. 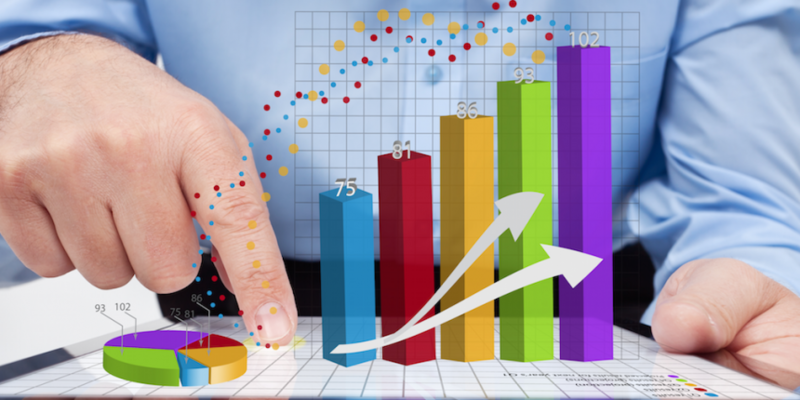 We have good visibility of [the market’s] major components right now,” he said. As Mognetti sees it, it’s not that bitcoin has become a moribund asset, it’s that earlier periods saw too much volatility. “It really depends on what window you look at. If you’re looking at two months, it’s OK, it’s consolidating. If you look at six months, it definitely rose a lot from a very low price. Even in May there was nice upside, from $400 to $560. That’s a 50% gain. I know a lot of asset managers who would die to get 50%,” he said. As for the news cycle, Mognetti thinks it’s going to take a lot more than a viral reddit post to get bitcoin prices moving these days. Bitcoiners were overreacting to newsflow in the past, seizing on every new announcement or reddit post to bid up or sell down prices frenetically, he said. But, it looks like bitcoiners are starting to grow up and settle down, he says, drawing a parallel with another market, the decidedly analogue trade in crude oil. “In the past a single tension in the Middle East would trigger a massive spike in [oil prices]. These days the market discounts [news] very early and doesn’t overreact anymore. It’s just a proof of the market maturing. Now only real news moves the market, it’s not about Twitter and reddit anymore,” he said. Ron Glantz, research director at Pantera Capital, probably the largest active bitcoin fund at the moment, with $150m under management, largely agrees. There’s been “no news”, he says, and that includes Dell’s announcement, biggest merchant or no. What could get the price moving again? Basically, whales. Exchanges are facing a liquidity issue – it’s drying up across the big exchanges, says Lamb, of Coinfloor. Exchange operators are faced with the challenge of keeping volumes up as speculative traders drift away from the relatively stable bitcoin price. Pantera’s Glantz concurs, observing that a big trade in these market conditions would shift the bitcoin price. “There isn’t much liquidity in the market. Someone trying to buy, say, $2m quickly will move the market,” he said. Whales aside, there’s the slightly more prosaic technical analysis to consider. George Sammantic, a co-founder of BTC.sx, thinks that prices could break out of their narrow trading band imminently, and more likely upward. Sammantic cites high support levels and tight Bollinger Bands as indicators that prices could break out soon. “Generally, minus some kind of news event, we should see the price start to move in either direction and only afterwards will we find out why. For now I see bullish patterns forming,” he said. 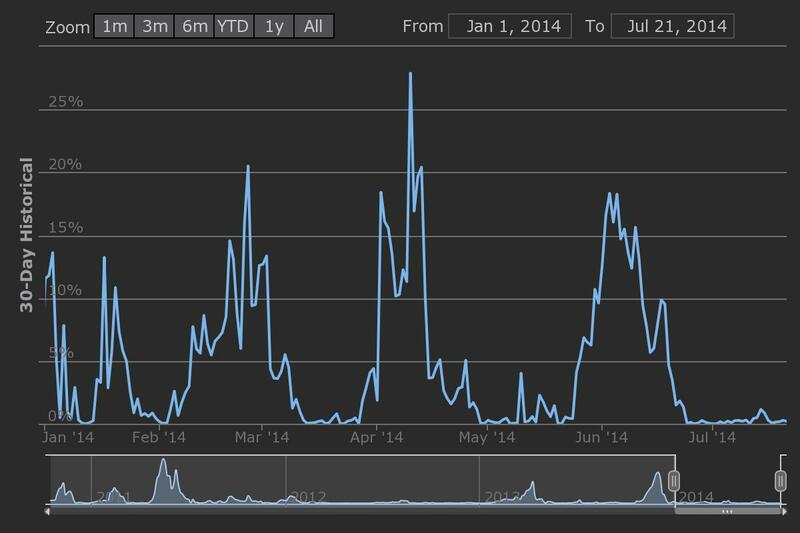 Coinometrics volatility index for year to date. What could those surprise news events be? Glantz of Pantera submits that it could be new capital controls, perhaps imposed on an economy facing spiralling inflation. “A lot of people in Argentina own bitcoins,” he notes wryly. Magnotti says he’s been flooded with requests to subscribe to his fund, even from traditionally conservative institutional investors – although he wouldn’t be drawn on giving specifics, citing client confidentiality. For market watchers who want to test Magnotti’s theory, he’s planning to start trading at the start of September, so mark your calendars.